The Everyone Graduates Center at Johns Hopkins University School of Education produced and eight-part video training series in partnership with the New Mexico Public Education Department, and the High Plains Regional Education Cooperative. The videos, materials, and activities are designed to assist school teams in planning, designing, implementing, and problem solving an Early Warning System. Video One offers an introduction and overview of an Early Warning System, functions, teams, and the Early Warning Indicators (EWI) meeting. STEP ONE: Download Video Viewer’s Guide. STEP TWO: Watch video and complete the activities. STEP THREE: Watch Frontline Video and complete the team activity. Video Two focuses on setting up EWS data systems including, background information on key pieces of data, suggestions for organizing the data, and recommendations for creating focus lists to help an EWS team respond. 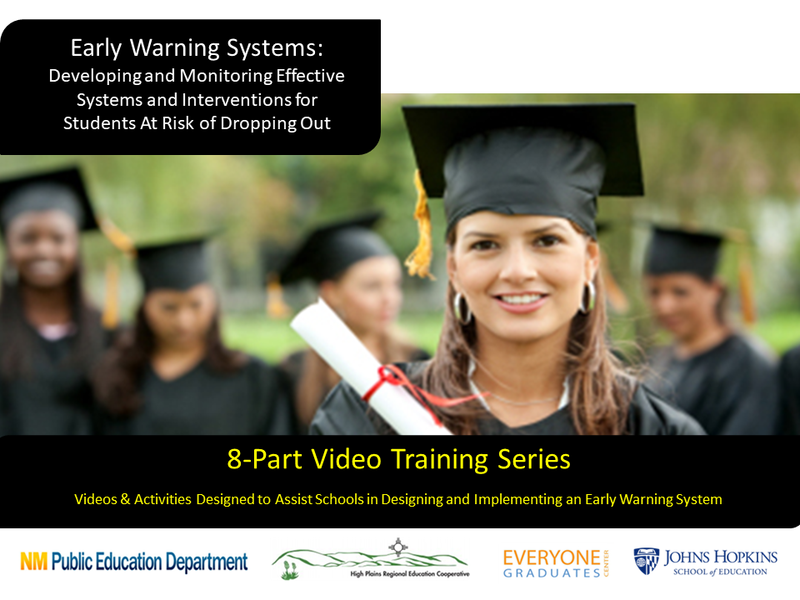 Video Three focuses on how to link indicators to a multi-level, tiered intervention system and explores effective interventions. Video Four focuses on building an EWS team(s) in your school; analyzing data and examining trends; organizing and holding EWI meetings; and how to best develop actions plans. Video five focuses on getting an EWS started, identifying a point person and team, lessons learned from early adopters, and ideas for further exploration and development. The sixth video examines insights and lessons learned from successful Early Warning Systems adopters. The video shares a few trends that have arisen and examples of how they have been addressed by different school throughout the nation. NOTE: There is no Viewer’s Guide for this video. The seventh video focuses on interventions, which we are describing here as the supports and activities that are being completed for a particular student or group of students. The videos also examines how school teams can collect data on the interventions that have been implemented and engage in a regular review process to identify gaps, align interventions, examine impacts and ultimately improve the supports that are being provided to students. This final video of the eight-part series focuses on successful EWS implementation that relies upon a multi-level support structure with the whole school being organized to support students’ success in Attendance, Behavior and Course Performance. This can range from the organizational structure, the safety of students in hallways, to the type of learning that students are engaged in during their courses and must be designed particular to the students in your school.